For over a year, his health was shrouded in mystery. 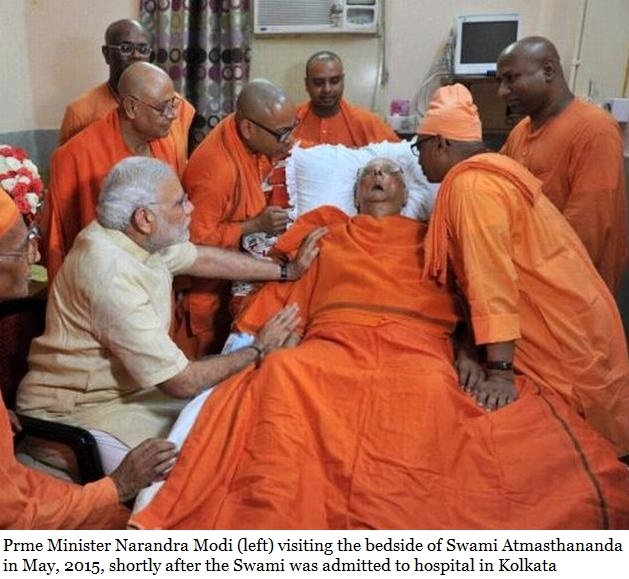 Devotees were permitted to touch his feet during visiting hours while he appeared to be peacefully reposing in his hospital bed at Ramakrishna Seva Pratisthan, a well-known hospital in Kolkata. Dignitaries could visit during other hours but without hope of seeing the once vital religious leader in a lucid state, for he had been in what insiders reported as a vegetative state at least since the autumn of 2016 (perhaps longer). 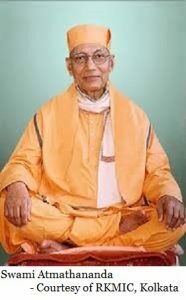 He was admitted to the hospital in February 2015, and last night at around 9:30 pm, Swami Atmasthananda 15th president of the Ramakrishna Order died, reportedly of age related ailments. He was 98. Born on Buddha Purnima, May 10th 1919, he joined the Ramakrisnha Order in present day Bangladesh near Dhaka at the age of 22, holding various posts until he was offered the opportunity to serve then president, Swami Virajananda. He spent several years in the service of Vijarananda in the solitude of Shyamla Tal in the Himalayas. The young Karma-Yogi or ‘worker-monk’ established himself in the field of health and welfare, earning a posting to head the TB Sanatorium branch in Ranchi as an Assistant Secretary. In 1958, he was sent to Rangoon (Yangon) Sevashrama as its Secretary in 1958 where, under his leadership, substantial improvements were made to the facilty; it soon was regarded as the best hospital of Burma (Myanmar) at that time. So much so, his work gained the notice of the newly established military junta prompting the dictatorship to take over the Sevashrama in 1965. Calmly Atmasthananda returned to India where he was posted to Rajkot branch as its head in 1966 for his efforts. Not to be deterred by the Burma experience, he channelled whatever disappointment he may have felt into building the temple of Ramakrishna at Rajkot Ashram. It was at the Rajkot Mission where Atmasthananda met and mentored Narandra Modi, prompting him to refer to the swami as his guru in later life. Modi’s guru would go on to be elected a trustee of the Ramakrishna Math and member of the governing body of the Ramakrishna Mission in 1973. In 1975, he was appointed an Assistant Secretary of the twin organizations, and was also appointed Secretary of the relief operations of the Math and Mission. Under his stewardship, the Math and Mission conducted massive relief and rehabilitation operations in various parts of India, Nepal and Bangladesh. He became the General Secretary of the Math and Mission in 1992 and continued in that post until 1997 when he became a Vice-President of the Order. In 1998, as a V-P of the Order and Mission, he visited the US, Canada, Japan and Singapore as well as Malaysia, Fiji, Sri Lanka and Bangladesh, spreading the Vedantic message of Ramakrishna, Sarada Devi, Vivekananda. He also gave spiritual initiation (mantra diksha) to aspirants located within and outside of India. Atmasthananda was elected as the 15th President of the Ramakrishna Math and the Ramakrishna Mission on 3 December 2007. While his accomplishments are manifold, he will likely be remembered for his influence on the life of one Narendra Modi. According to The Times of India, his influence on Modi was “life-changing”. In fact, by the time they’d met, young Modi had already spent some years wandering India in search of a spiritual solution to his yearnings, inspired as he was by the life of Swami Vivekananda (founder of the Ramakrisnha Mission). He felt it was a natural fit that he join the Ramakrishna order as an initiated monk, and was determined to do so after meeting Atmasthananda and staying at the Rajkot Mission. To Modi’s surprise, the Swami rejected Modi’s offer to join, advising him that his destiny lay elsewhere. Sanyas – or the path of renunciation – was not for him, Atmasthananda had said. A bewildered Modi returned the Rajkot ashrama where he stayed for a short while longer under the wing of Atmasthananda. Under his guidance, a refocused Modi left to enter politics. He would later tell people that Atmasthananda was his guru, and were it not for his mentorship, he would could never have hoped to achieve his life-long aim of becoming Prime Minister. 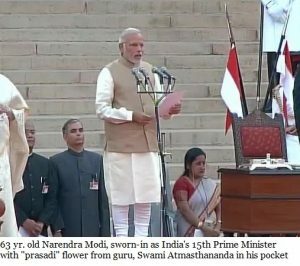 Indeed, Modi had a “prasadi” flower in his jacket pocket when he took oath as Prime Minister on May 26, 2014. It had arrived in Delhi along with a letter from Atmasthananda addressing him as Narendrabhai. 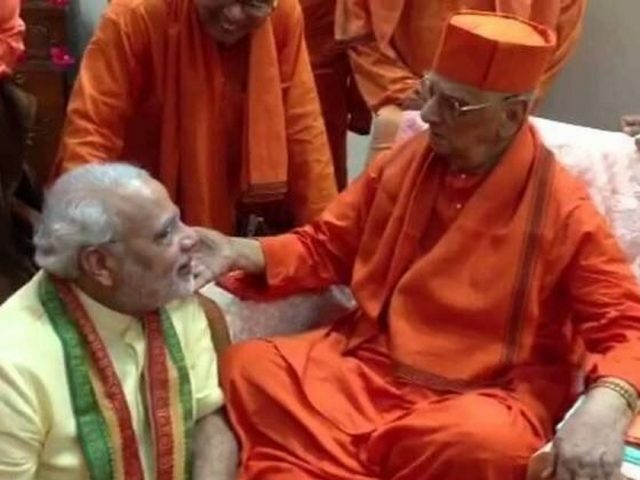 Modi had previously written to the Swami expressing his desire to visit him at the headquarters of the Ramakrishna Mission in West Bengal as Prime Minister. He ended up visiting the Swami while he was in hospital where Modi said, the two had a long conversation. While it was not long after the BJP’s historic victory in 2015 that he fell into a coma, the Swami did witness his vision for Modi coming to fruition before succumbing to his health problems. In that way, it could be said, he may well have changed the course of Indian history, guiding a would-be transformative figure to head the world’s largest democracy with the first ever decisive majority for Modi’s party after over a decade of weak governments. CM of West Bengal Mamata Banerjee, who, apparently, paid a visit to the ailing Swami hours prior to his death, expressed her condolences in a tweet. The revered Swami will be cremated at 9:30 pm, today, perhaps fittingly on World Yoga Day, at Belur Math.